Madden NFL 18 is an American football sports video game based on the National Football League, developed and published by EA Sports for PlayStation 4 and Xbox One. The 29th installment of the Madden NFL series, the game features New England Patriots quarterback Tom Brady on the cover, the second straight year a Patriots player has had the distinction, following tight end Rob Gronkowski. It was released worldwide on August 25, 2017, although those who pre-ordered the "G.O.A.T. Edition" were able to play it three days earlier and access their copy on August 22, 2017. It is the first game of the series since Madden NFL 2005 not to be released on both PlayStation 3 and Xbox 360, and also the first game in the main series to be available on only two platforms since Madden NFL '94. Longshot story mode - Guide forgotten prospect Devin Wade on his journey to the NFL draft in Madden's first-ever cinematic and playable story mode. MUT squads - Online team play is back with Madden Ultimate Team. Team up with your friends and build your dream team of past and present players. All-new Target Passing - Target Passing gives you total control over where the ball is thrown—no more being tied to the open receiver. Pass to whoever, wherever. It comes as no surprise that one of the most well-known modes in Madden 18, Madden Ultimate Group, keeps players coming back frequently. Ultimate Team consists of players opening packs of trading cards which contain actual NFL Players to make use of in your team in Madden 18. 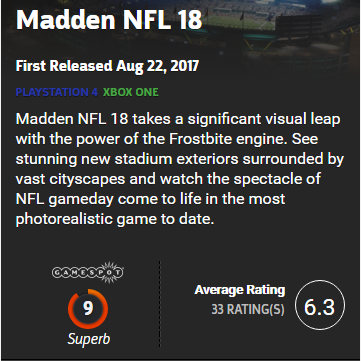 Madden NFL 18's Longshot story mode has received rave reviews ever since its release in August last year. So the purpose of this guide is for you to enjoy better in Longshot story mode. Here's a look at the top tips for players who want to take on the role of quarterback Devin Wade. Let's dive into this guide. In Madden NFL 18, five fresh quarterbacks are immediately available for you to flesh out your fantasy roster. Because the first round of 2018's NFL Draft is in the books - with impressive speed EA has already made all 32 players available in Madden 18 Ultimate Team. On the defensive side of the ball in Madden 18, it's all about reacting to your opponent's moves. You can call the best play possible, but it won't mean anything if you don't adjust according to your opponent.